An incredible painting which I remember just dying to see ..I saw it over Christmas sometime in a not so distant past, it was raining in Madrid. it is all now available to see online in the greatest detail, the kind of detail you won't be able to see in person. I spent hours with this painting over several days, while also seeing Reina Sofia and Thyssen-Bornemisza Museum, as well as the Royal palace. One of the things I noticed about artists is that they rarely talk about art or are rarely interested in art and I will try to start a conversation about an important artwork or just simply about art and people are just not interested you know, people like to make things. People like to make tchotchkies because tchotchkies require no thinking and no ideas of your own. To think is difficult, to think up something new is difficult. How can you make art unless you know what is the best there is in art that has ever been created, whether in the past or in the present, the purpose of creating stuff is to measure up to the best there is. what other purpose could there be for art other than to measure up or surpass whatever has been done in the past in some manner. I don't want to personally be buried in historical detail I don't really care about the past but I care about what has been done which is absolutely the best there is, that is important, it is really important to know and measure up to the most significant artworks that have ever been created. I had such a punch in the stomach at Delacroix at #TheMet , I will be coming back many times, truly felt the super powers of art. Incredible one in a life time exhibition, and I have never been a Delacroix fan before. The most important thing an artist have to tend to in their career is their heart and soul. Today is a windy day in New York city and i am not doing the installation I planned, it is going to be essentially kites blowing in the wind day. So it is back to basics day, i go over some ideas, i look into my favorite philosophers, art history and think about the ideas and the books and the work i will make. Artwork is being wrongly described by medium – art is the heart and the soul of the artist coming through a medium. Throughout history artists have been involved in some sort of shenanigans, whether happenings, parties, studio 54s and factories, down the rabbit holes, insane asylums, Pacific islands, ideas, ideologies, fights for freedoms and rights, there’s always some sort of writhing which always accompanies the gardening of the soul. Transcending reality just like escaping gravity, needs super power of some kind, a burst, a bomb, a will, and a lifetime of all of the above. Here in this Delacroix self-portrait you can see said power for yourself. And I didn't see even one third of the show, and there was another exhibition composed entirely of his drawings. I had such a punch in the stomach that threw me back to where I came from to begin with. To the very beginning of why i want to do art in the first place. Delacroix's world is my world. The world of Michelangelo, Durer, Leonardo, Rembrandt, the greatest artists in the world that ever lived, and their spatial and chromatic sensibilities. This is why I like brown. And marble. I had such a head spinning experience and there was so much emotion in me and so much taking in of paintings I couldn't sit still at the exhibition and will be coming back many times. Delacroix will be my beacon and mentor for the next few months. I will come back to see his work, and his words. I reflect on why i think beauty is important. Beauty is important because it transcends and transports, and my own duty in this world is to produce as much of it as I can, and cause as much of it as I can in the world. As I sit here reflecting on Delacroix, I think a manifesto of sorts, of what to do. I will do relentless beauty through works large and small. I will work with ideas large and small, that reverberate. I will put enough power, intellectual and worldly so these ideas have enough trajectory to shoot upwards. I reflected on what I want to achieve with my Memory Replacement World Trade Center installation and performance - I want to overwhelm with beauty and color and life, with a human touch, with a personal stroke and with the closeness and within the personal space of a human being. Work in the valley gave me an an unlimited travel budget, in addition to a hunger to find the best players in what I considered my field. My field was art and through interactions with other artists and research on my own I decided to focus on the top players in my field, and study their work in person. So I went to London and went through the National Gallery as well as the Portrait Gallery and other museums, not sure what my top artist was there but a lot of Renaissance. I went to Paris to study the impressionists, my visit to Musée d'Orsay changed my entire attitude and changed the way I look at art. Until that point I had not much respect for impressionism. After that point I gained much respect for both impressionism and art, and got a glimpse of what a profound change in seeing involves. With this newly gained perspective i started looking at Van Gogh. I went to Amsterdam and the Hague and in addition to Van Gogh looked at Rembrandt, Bruegel and the Northern Renaissance. I discovered Vermeer in person - I was running through a gallery at closing time and arrived, almost out of breath, at one of his smaller paintings. I was stunned and this small painting took my last breath away. Anyway - back to Paris I resumed studying with sculpture and painting, and started studying Picasso and Dali. I continued my education on Picasso and Dali in Madrid, where there are three major museums stuffed with the best the world can offer in terms of painting, including Goya, and Hieronymus Bosch. My interest in Bosch came after I got acquainted with surrealism, and his work as a sort of a predecessor, the first surrealist. Now big impact on my consciousness was of course Rome and Florence. The Vatican museums and the Uffizi produced in me growth equal in its intensity to that of going to the moon. I stared at the Botticelli and other pre-Renaissance for hours on end. Most impact on me in Rome was produced by the sculptures in the Vatican museum, and by the work of Michelangelo. Later i saw Bernini in person as well - I spent a whole day with his sculptures at Galleria Borghese. With all this newly acquired knowledge and new standards I started spending more time in New York and the galleries there. I was flying on weekends to see the major museums, including MOMA and the Whitney. Modern art entered my consciousness, with the solid backing of old art. And here I will pose for a minute, because art has and will always be at the forefront of what I consider worthy of thought. But there is another thing I discovered, which is a school of thought which dealt with how we see the world, and it had little, if anything to do with art. I went to Japan, and in a summer I spent time in several temples of the Rinzai school of Zen in Kyoto. Sitting on the mats somewhere in Arashyama, surrounded by ponds and zen gardens, I was struck by lightning. Her I found, I saw and felt, the ultimate efficiency and beauty of simplicity. I saw and felt the effects of Zen and later on adopted that outlook for my life. What did the discovery of Zen mean? It meant that on my return to America I started seeing how much time and resources we expend on things that fill our rooms and our environment. I remember a conversation with someone about their experience with a seventy thousand dollar kitchen in Westchester. Imagine the amount of pressure and resources that would take to cut up a simple salad. it's like having dinner and dragging a locomotive behind. When I think of dinner - i imagine going to the fruit stand guy on the corner, having an avocado, a few tomatoes, fruit, eating it in a park or in a nice public space somewhere in Manhattan and using the rest of the time and resources to have fun and enjoy the company of family and friends, of galleries, museums and theaters, libraries if you want, of which our city abounds. To sum it up and to circle back to the title I gave to this post - I had the piece of mind and resources to study what mattered to me without the pressure to produce immediate results and act on the so gained knowledge, and to expand my outlook on the world and find a set of beliefs and standards for life that struck a chord with me. A once in a lifetime exhibition at the Metropolitan Museum of art in New York. It is the Met's gift for us for the Holidays. There is no greater power in the world than that of being a creator. When you are a creator you are in control. Everything else is an agenda fed by someone else. We are constantly told by media, papers, whatever visual and auditory space available, that we should be eating, drinking, remodeling kitchens, buying and saving money, I think that one last thing has in such a great way deformed our consciousness that there is this anxiety that we have to be constantly on the intake. We walk around with this anxiety for the next intake, I am astonished by the amount of time and energy spent in this city on discussing, cataloging and planning past and future meals, and the acquisition of objects. Yet, there in the dim light of the Met were these really faint ( by modern standards ) marks on paper that produced in me such great pleasure to observe and contemplate them, and I bet in others too, judging by the crowds. Really, nothing of substance at first glance, certainly nothing to be chewed on. Just marks going here and there, up and down and in circles. these markings, however faint, produced great emotions and appreciation. Pretty wondrous effect given that the author has not been around for the last 500 years and hardly ever comes up in conversations and on television. The greatest power in the world is the power to create, we have hardly control over the first 20 years of our lives, we are placed and educated somewhat unwillingly and the only thing we can truly will is something of our own, something no one has ever produced before us and no one ever will after. 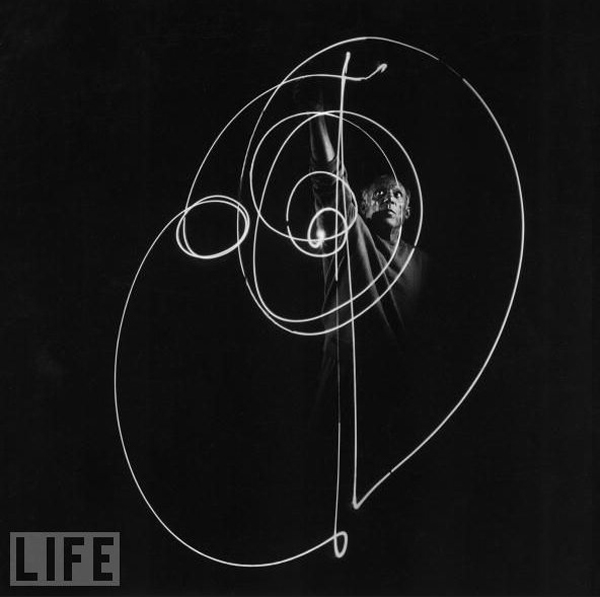 photographed by Albanian born photographer Gjon Mili.